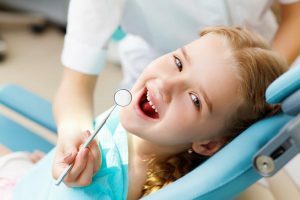 Are Sealants Necessary for Kids? - Gernot H. Winkler, D.D.S. About 91 percent of Americans will develop tooth decay in their teeth at some point in their lives. It would seem that getting cavities is as natural as hair loss or any other degenerative health problem. However, that doesn’t mean that cavities and tooth decay shouldn’t be avoided at all cost as they can lead to a number of health problems over time. To prevent cavities, you have to maintain good habits when brushing and flossing your teeth. On top of that, there are other options to guard your teeth against cavities: sealants. In this blog, we’ll discuss what sealants are, how they work, and if your child needs them. Sealants are a thin, plastic protective coating that is painted over the fissures and valleys on the parts of the teeth you use to chew food. This procedure is quick, painless, relatively cheap, and non-surgical, making it a perfect preventative measure for children. The sealant is first applied on a blow-dried tooth in liquid form. Then, a dentist “cures” the sealant with a special light that activates a catalyst in the liquid and causes it to dry. Lastly, the dentist checks your bite to make sure it doesn’t affect the way your teeth meet. Sealants last for several years before needing to be reapplied. Sealants work by covering the gaps and valleys in your teeth where food can often get stuck, especially in your molars. The food that’s stuck is sometimes difficult to reach with a brush and floss and so it stays there and essentially rots in the mouth. Then it becomes breeding ground for bacteria that eventually cause cavities. Does My Child Need Them? At our office, we recommend sealants for children. The Center for Disease Control (CDC) has found that among primary school-aged children from 6-11, kids without sealants were three times as likely to get cavities than kids who had sealants. Unfortunately, because of the price of the sealants (approximately $30-40 a tooth), low-income children were two times less likely to have any sealants. Some dental plans will cover sealants so be sure to look into your coverage. Of course, don’t wait to set up a dental visit for your child just for sealants. Rather, make it a part of your routine visits and inquire how many sealants may be recommended or need to be reapplied. Even if your child has not had problems with cavities so far, it is a wise preventative measure. As a testament to their benefits, the CDC encourages states to help millions of children prevent cavities by implementing programs that offer dental sealants in schools. According to the American Dental Association, sealants are safe, containing a minuscule amount of BPA that’s not enough to cause any harm. Simply breathing air exposes us to 100 times more BPA than dental sealants! Additionally, there are no known side effects from sealants. Routinely brushing and flossing are still the best ways to prevent cavities. Sealants can help to prevent cavities from forming and even stop early stages of decay. Have more questions about the benefits of sealants? Give us a call. We’ll happily guide you through the process and put your child at ease with this easy and painless procedure. We can schedule an appointment for you and your child at your convenience to handle any necessary dental work. Our office specializes in all types of dentistry – general preventative work, cosmetic treatments, and restorative care.